Introduction: Under no circumstances should a kickball supporter attempt this recipe. It’s just too fiddly. Kickball supporter, know your limits! The Kop at Anfield dates back to 1905-06, the season that saw Liverpool lift the second of their league championships. It was christened as the Spion Kop by Ernest Jones in memory of the many scousers who died in the Battle of Spion Kop. The battle was fought about 24 miles from Ladysmith on the hilltop of Spioenkop (meaning hill with a view) along the Tugela River, it was between the South African Republic and the Orange Free State on the one hand and British forces during the Second Boer War during the campaign to relieve Ladysmith and resulted in a British defeat. Line up the two 12-cup muffin tins with cupcake liners. Sift together the cake flour, baking powder, and salt into the medium bowl and set aside. In the small bowl, mix food colouring and cocoa powder to form a thin paste without lumps and set aside. In the large bowl, using a hand mixer or electric mixer, beat butter and sugar together until light and fluffy, about three minutes. Beat in the eggs one at a time and then beat in the vanilla and the red cocoa paste. Scrape down the bowl with a spatula as you go. Add one third of the flour mixture to the butter mixture, beat well, then beat in half of the whole milk. Beat in another third of flour mixture, then second half of the milk. End with the last third of the flour mixture, beat until well combined, making sure to scrape down the bowl with the jolly old spatula. In the other small bowl, mix vinegar and baking soda. Be careful as it will fizz. Add vinegar mixture to the cake batter and stir well. Fill cupcake cups with cake batter until they are a little under 3/4 full. Place muffin tins in your preheated oven. Bake for approximately 20 mins, rotating pans halfway through. The cupcakes are done when you are able to pat the tops and the cake springs back up. If it sinks down they are not yet complete. Or you can insert a toothpick into the centre of a cupcake in the centre of the tin and if it comes out clean they are done. Cool the cupcakes in their tins on a wire rack for 10 minutes then remove and allow to cool completely before frosting. Make sure all of your frosting ingredients are at room temperature. In another mixing bowl, mix butter on medium speed until light and creamy. Add cream cheese and mix until fluffy. Add the cooled melted white chocolate and mix until combined. Slowly add the sugar, one cup at a time until you have the consistency and taste that you prefer. This required a steady hand and a clear mind. Pipe the frosting onto the cooled cupcakes, I like to use a drop flower nozzle. The icing can get a little soft while using. If so, put the iced cup cakes in the fridge until the icing has set. Serve on the tea plates and scoff. Introduction: Another recipe inspired by the great supporter of Reading F.C., my friend Alien. He told me that Reading were once called the Biscuitmen because of an association with Huntley and Palmers, who were based in Reading. This is a recipe incorporating biscuits and blueberries as discussed in The Ferryboat on Sunday, 10th March 2013. Huntley & Palmers was a British firm of biscuit makers originally based in Reading, Berkshire. The company created one of the world’s first global brands and ran what was once the world’s largest biscuit factory. Melt the butter in a large saucepan, don’t get it too hot or the butter will burn. Remove from the heat and stir in the biscuit crumbs. Tip them into the base of the cake tin, pressing them down with your fist to make a firm base. Chill in the fridge for about 20 minutes. While it is chilling you make the filling. Beat the soft cheese in the mixing bowl until softened, then whisk in the condensed milk, vanilla extract, eggs and lemon zest. 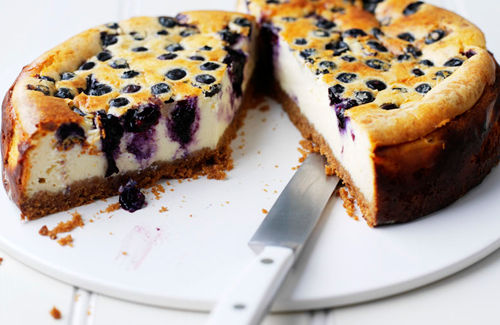 Pour the filling over the biscuit crumb base, then sprinkle the blueberries over the surface. Stick on the middle shelf of the oven to bake for 1 hour, until set. Leave until completely cold, serve. Apologies to Kate who cannot eat this because of all the dairy shenanigans. Alien also told me about his family’s claim to fame regarding H&P. 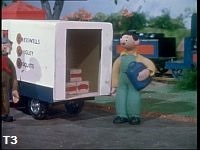 The children’s TV series Chigley, narrated by Brian Cant, features a biscuit factory called Cresswell’s (perhaps a play on words for Crosse and Blackwell?). The factory was based on Huntley and Palmers where Alien’s great uncle worked. The character Willie Munn is based on him. Here is a picture of that famous Biscuitman.